A few years ago I read Oscar Wilde's The Picture of Dorian Gray and loved it. 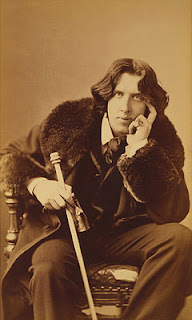 I loved Wilde's writing style, the way he had with words and the story of Dorian's fall from innocent to Eeee-vil. Anyway... Dorian Gray is beautiful. Like stop the clocks beautiful. And everybody is always telling him so. An artist named Basil creates a spectacular painting of him and while admiring himself he wishes he could always remain that way. I guess the planets were aligned because Dorian gets his wish but at a terrible price. While Dorian remains young and handsome, the painting gets older and that's not all. Knowing he can't age, he begins a life of vice and debauchery. Lot's O'Debauchery. He drives people who get involved with him to suicide. And commits murder. The worse Dorian gets, the uglier his painting becomes. Take a guess at where this is heading. If you were going to read The Picture of Dorian Gray, I'd tell you to read the original first. Although the graphic novel is full of Wilde's great one-liners, you don't get the full effect of his wit. I also thought that Lord Henry came off as a jerk in the graphic novel where in the original he was someone who didn't mean half of what he said. As for the illustrations, they were more cartoony than I thought they should be, although they were very well done. I like the artist's interpretation of the painting. 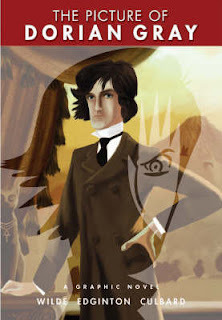 So I recommend this graphic version of The Picture of Dorian Gray but not before you read the original. Since this is St Patrick's Day, I thought it was fitting to post this review of one Ireland's most famous writers. Wilde once said of himself: "Basil Hallward is what I think I am: Lord Henry what the world thinks me: Dorian what I would like to be — in other ages, perhaps."